The Chauci (or Cauci, Chauken, or even Caülci) formed a relatively large tribe, comparable to the early Frisians in number. By the second century they were located in the far north-western corner of modern Germany, between the lower Rhine and the Elbe. To the south were the Tencteri and Usipetes, to the south-west were the Bructeri and Chamavi, with the coastal Frisii and (probably) the Campsiani to the west, and the Aviones and Reudigni to the north, across the Elbe. In the early first century AD, Pliny and Strabo describe the Chauci, Cimbri, and Teutones as inhabiting central Denmark, forming a group known as the Ingaevones. ('Ingaevones' itself may be a derivative of the later Angles, who may have been part of the same collective, along with the Jutes). Strabo says that the Romans introduced the name 'Germani' because these tribes were the 'authentic Celts'. Alternatively, it is possible that the Germani were allies of the Celts (a theory that is supported by Edward Dawson). The construction 'Ger-man' breaks down into 'ger' (still used in English as 'gar', the name of a fish) meaning spear, and 'man' which is unchanged in meaning. 'Her-man' is another form of the word. It was likely to have been formed of 'ger' for a spear and 'ker' for an army of spearmen, for which 'k' was softened to an 'h'. Some sources suggest quite wrongly that Germani means 'neighbour' or 'men of the forest'. Instead, the possessors of this name were tough, fierce killers and would not have named themselves anything quite so friendly. The Romans introduced Germani because they consistently heard both forms from the Germans themselves: 'herman' as in Hermunduri, and 'german', because these warriors called themselves just that: spearmen. The Heruli and Cherusci names may also derive from or contain this root word for spear, meaning an army (of spears). The Chauci had settlements both along the coast and further inland, especially along the banks of the Weser, which flowed through the centre of their territory into the North Sea. The coastal Chauci lived on man-made hills called terpen which protected them from the tidal flooding that affected the coast of the Netherlands and Denmark prior to the building of dikes. The Angles to the north were also well known for this form of abode, and they and the Chauci, along with most of the other local Germanic tribes, possessed the same material culture, making it difficult to distinguish between them archaeologically. The Chauci are first mentioned in written records by the Roman General Drusus (adopted son of Augustus), who is undertaking a military campaign to the north of the Rhine from newly-conquered Gaul. Apart from fighting the Frisii he also confronts several other tribes, including the Chauci. 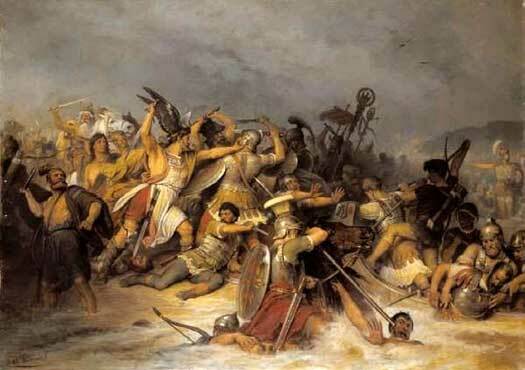 After devastating lands north of the Rhine, Drusus gains the acquiescence of the Frisii before turning on the Chauci. The tribe possibly makes itself a target by participating in the failed naval action against Rome earlier in the year. Luckily for them, the receding tide traps his vessels and he is forced to withdraw and avoid further conflict. Arminius declares the independence of the Cherusci from Rome, decimating three legions in the Teutoberger Forest. He achieves this momentous victory in an alliance with the Bructeri, Chatti, Chauci, Marsi, and Sicambri. The Dulgubnii, Tencteri, and Usipetes are also very likely to be involved. The Bructeri, Tubantes and Usipetes certainly team up to harass the troops of Germanicus AD 14, and they are later included in his triumph. Germanicus invades northern Germany seeking revenge against the tribes involved in the attack and, following two Cherusci defeats (Idistaviso and the Battle of the Angrivarian Walls in AD 16), Arminius is murdered in AD 21. 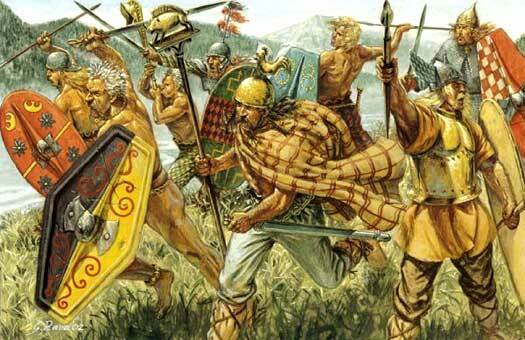 Unusually, the Chauci are not included among the tribes to suffer vengeance at Roman hands. Instead, they appear to promise aid to Rome and, when the vessel carrying Germanicus in one of his campaigns (presumably along the Rhine) is wrecked during a storm, the general is saved by reaching the lands of the friendly Chauci, of which there are still serving auxiliaries in the Roman army. Strabo mentions the Chauci as being indigent when compared to their more nomadic fellow Germanics further east. The nomadic peoples, such as the Langobards and Hermunduri, have little enough so that they can simply load up their wagons, abandon meagre, temporary huts and move in whichever direction best suits them. The Chauci and neighbouring tribes, such as the Campsiani, living near the coast seem not to enjoy even those 'luxuries'. The Chauci continue to provide auxiliaries to the Roman armies through their treaty obligations, but that does not stop them from acting independently or in concert with other Germanic tribes when they oppose the Romans. There are wars in which Chauci are to be found on both sides, with those serving in the Roman forces continuing to obey their orders and carry out their duties normally. Treaty obligations are clearly kept separate from other decisions made by the tribe. The coastal Chauci have already been noted for their seafaring ability, and it seems they turn this to good use, raiding the coastline of Roman-controlled Gallia Belgica to the south of the Rhine in this year. This is doubtlessly one of many such raids against wealthy imperial targets, many of which are later forgotten or are not recorded. The Chauci and Frisii are to be found under the command of Gannascus of the Canninefates. Together, they continue to raid the coastline of Gallia Belgica. The Chauci also penetrate territory in Gallia Belgica that in 80-83 is reformed into the Roman province of Germania Inferior (it now forms parts of the southern Netherlands). The newly-appointed Roman military commander, Corbulo, engages the attackers in battle and defeats them. He also places triremes on the Rhine and takes on the Chauci vessels, successfully destroying those too. Gannascus is driven out of Gallia Belgica and the Frisii are occupied by force. Under the pretence of holding negotiations with Gannascus, the Romans assassinate him. This dishonourable act causes outrage among the Chauci, and Emperor Claudius orders a withdrawal of Roman forces to the Rhine in order to ease tensions. Having been centred on the Weser and Elbe until now, the Chauci expand westwards as far as the River Ems, probably driven by the need to find new land for their flourishing population. To achieve this expansion they expel the neighbouring tribe of the Ampsivarii. They now find themselves bordered to the west by the Frisii. Gaius Julius Civilis leads a Batavian insurrection against a Rome which is distracted by the events of the Year of the Four Emperors. Supported by the Bructeri, Canninefates, Chauci, Cugerni, and Tencteri, who send reinforcements, he is initially successful, with Castra Vetera being captured and two Roman legions being lost. 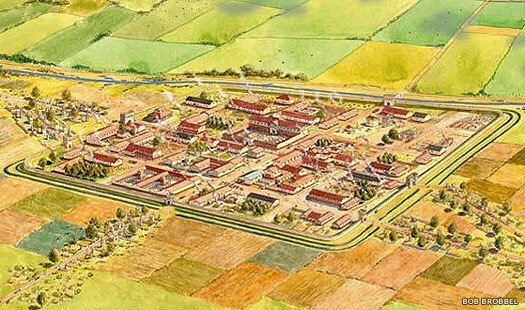 In AD 70 the Chatti, Mattiaci, and Usipetes join in, besieging the legionary fortress at Mogontiacum (modern Mainz). But to illustrate the dual nature of Chauci policy towards Rome, both they and the Frisii have auxiliaries who are serving with the Romans. A cohort of these are trapped and burned at Colonia Claudia Ara Agrippinensis (modern Cologne). Eventual Roman pressure, with aid from the Mediomatrici, Sequani, and Tungri, forces Civilis to retreat to the Batavian island where he agrees peace terms with General Quintus Petilius Cerialis. Pliny the Elder writes about the coastal Chauci, having visited them during his service in the region. He describes them as fishermen who live in wretched circumstances in small cottages along a barren coastal landscape. They have no flowing water, gathering drinking water from ditches, and collecting local peat for fuel for their fires. But despite their meagre lifestyle they will strongly protect their independence. Ptolemy, who writes in the mid-second century, places the Langobards back on the left bank of the Elbe, between the Chauci and the Suevi. He also has a group of them, the Suebic Langobards, occupying territory to the south of the Sicambri in the Rhineland. This seems to suggest either that they have expanded or that a smaller splinter group has migrated westwards. The coastal Chauci have long been sea raiders, but by the late second century the problem has grown much worse. Now Chauci raids are as bad as the better-known Saxon raids of the fourth century, but what is assumed to be their last recorded attack happens in this period. Archaeological finds show a layer of destruction along a great deal of the North Sea and Atlantic coast of Europe, between Belgica and southern Gaul, and in eastern Britain. The Chauci are prime suspects for the raids, and Rome responds with improved defensive measures over the following thirty years or so. Fortifications are put in place at sites including the Iceni civitas of Venta Icenorum (modern Caistor-by-Norwich), the Trinovantes town of Caesaromagus (modern Chelmsford), and the civitas of the Canninefates, Forum Hadriani (modern Voorburg). This is the start of the system that will develop into the Saxon Shore in Britain. The Saxons begin forming a loose state in northern Germania, and become relatively important in the region. Their tribal collective is swelled by the absorption of smaller tribes, such as the Chauci, with this large coalition of tribes occupying the territory between modern Berlin and the northern Frisian coast. The nature of the coalition is unknown, although it probably contains a fairly equal amount of conquest and voluntary accession, something that has been happening for some centuries with various Germanic coalitions. The individual identity of the Chauci is assumed to be lost over a gradual period, and the Saxons take over the Chauci practice of coastal raiding. King of the Hugas? Subject to the Frisians. The Chattuarii appear to be named in both in Beowulf and the Widsith list as the Hætwerum (Hetwaras). They form a coalition with the Frisians and the Hugas (who may be the later Chauci, although the link is entirely theoretical) to fight a Geatish raiding party led by Hygelac. The king of the Geats is killed, his party heavily defeated, and only Beowulf escapes. The warrior Dæghrefn is not easy to identify, but he is called a Huga, and may be their king, subject to Frankish or even Frisian overlordship, or he may be a particular type of Frank, such as a Neustrian or Austrasian whom the audience should automatically recognise.